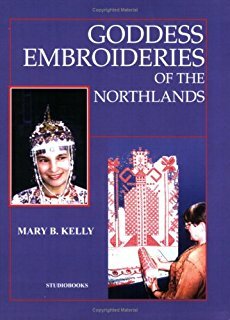 Goddesses of the Northlands is authored by artist and professor, Mary B. Kelly. Professo Kelly spent more thank 20 years researching goddess figures on Eastern European textiles. This final volume in the Goddess Embroideries trilogy presents the story of change and migration in the countries bordering the Arctic Circle. Folk beliefs and the symbols that represented them were carried on ritual textiles from Siberia to their new homes to the west, first, along the Silk Road, then up the Volga and finally into north Russia, the Baltics and Scandinavia. The author highlights the textiles and ceremonial folk dress as well as the customs that accompanied their making and use and shows the symbols and motifs in more than 200 illustrations and photographs.